Just Jingle: Skipping Stones Design Sketch Tuesday - Joy! Hello, there, folks! It's a rather chilly Tuesday here in New England, so I figure we should just warm that up with a bit of Holiday Cheer, what do you think? You agree? Well, then! How delightful! (*Note: If you didn't agree, I ignored you completely. Just say'n.) So. Here we go, then. HA! It's Sketch Tuesday over at Skipping Stones Design and that means that we have a new sketch for you! It is a pretty great one created by the fabulous Jen del Muro and I'm SO SURE you are going to want to play along! Keep in mind that you can use any supplies you have on hand (you don't have to use SSD stamps), but you WILL have a chance to WIN SSD stamps, so that is pretty great. Just say'n. 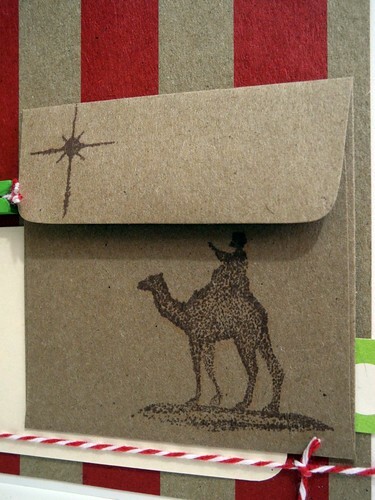 AND...we are still playing with Canvas Corp. goodies this month and I am LOVING IT! The papers (love that bold stripe), clothespin, and envelope are all from Canvas Corp. 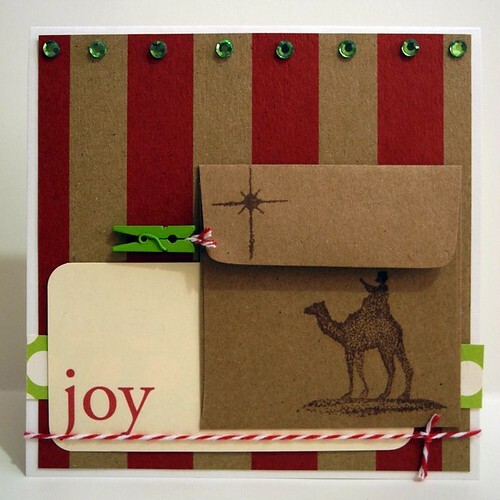 I used the Wisemen stamp set and some yummy twine and a flashcard I had hidden in my stash! And THAT, my friends, is my card for today! Oh! I am officially done with my Christmas shopping. By that I mean that I have everything that I should buy, but I totally will be picking up a couple little things over the course of this week because I'm just crazy like that. HA! I suppose that is good because I'm pretty much in the 'eternally tired' zone created by the combination of the longest, darkest days of the year and the holiday insanity. Just say'n. Am I alone in this? Anyone? Anyone? K. I didn't think so. That's good to know. Thanks. Luv ya! Beautiful!! Love all the elements! Oh this one is beautiful! Love all the kraft. I love winter - we put a log in the fire place and that always brighten my day. What a great Holiday LO~~ Love it!!! Hope you have lots of JOY over the festive season. Very pretty...and I love the little envelope on the front. Another lovely card. Have a Merry Christmas! Very unique...I love the pocket on the front!! I'm right there with you in the eternally tired zone, jen! Between the dogs insisting that 4 am is a good wake up time and the holidays, I just can't wait to sleep in...not that it will ever happen, LOL! LOVE this! Such a fun color combo against the kraft cardstock! How awesome is that? I love it! Ahh, this card makes me smile. Fun and cute but really expresses the true meaning of the holiday. You're certainly not alone! I'm part of the insanity club too;) Hang in there and keep creating your beautiful cards! This is fab! Love the kraft and how you incorporated all those CC goodies!! Sweet card :) Love the colours and the pocket in the front. This is beautiful, Very proud of you and all that creativity!! Can you bottle it up to sell to the rest of us?? This is wonderful! 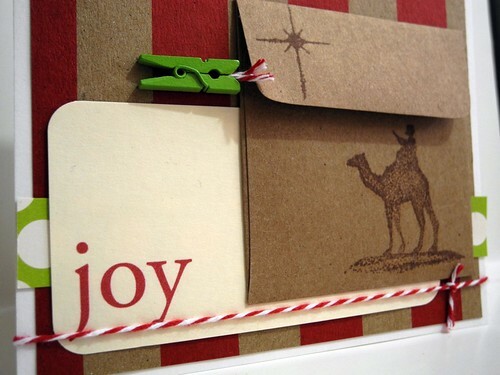 Love the tag and envelope and that awesome pop of color with the ribbon. Happy Holidays!